A full service should ideally take place once a year or every 20,000 kms (12,000 miles) in order to give you the best chance of trouble free motoring. It will include many items not looked at on an interim service. Regular servicing will also extend the lifespan of your vehicle, helping to ensure your safety and the safety of your passengers on the road. A full service will typically everything done on an interim service as well as a thorough engine check, Spark plugs, glow plugs & associated leads check, gear oil, power steering and diesel particulate filter checks etc. Also a full suspension, shock absorbers, mountings and wheel bearings check is carried out. 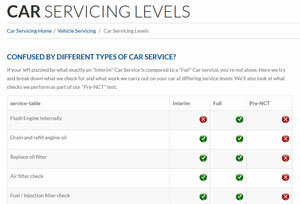 There’s a lot more done that can be easily described in a few paragraphs, so to see exactly what Coby Auto's Full Service includes, along with what's included on an Interim Service and what our Pre-NCT test entails, see our Service Levels page. Having your car serviced is another expense that it seems we can do without sometimes. However, the importance of servicing your vehicle cannot be overstated. Regular servicing helps to ensure that there is no undue stress on critical car / engine components which can turn into much bigger problems further down the road. Many of the breakdowns we see on the road can usually be directly related a lack of servicing. A regularly serviced car will run better, use less fuel, be kinder to the environment and will save you real money in the long term as you'll be much less likely to suffer serious car trouble. What date / time best suits you to have the service done? Anything else you'd like to add or feel we should know?